The High Priestess is Out of the Closet! Picture this: A weekend conference in which people come from literally all over the world to celebrate their interest in the Tarot, to honor the message of the High Priestess, and to hone their intuitive abilities. On the weekend of April 29 through May 1, I attended the 9th annual Readers Studio held in New York City. Over two hundred Tarot enthusiasts from Canada, Great Britain, Brazil, Australia, Germany, India, Israel, Singapore, China, Japan and almost every state in the U.S., gathered to take classes, peruse the exhibit hall for new Tarot decks and books, and pay homage to, and learn from, some of the world’s best known Tarot leaders, teachers and authors. Above all, we gathered to share our passion for this powerful tool with an ever-growing community of Tarot enthusiasts and Tarot adepts. 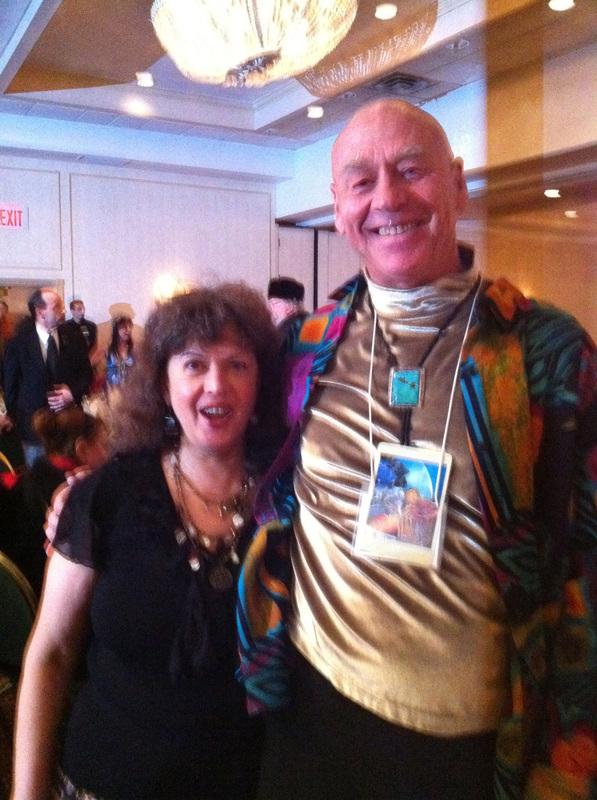 The event was sponsored by The Tarot School and the hosts of the event were Ruth Ann and Wald Amberstone who founded their school in New York City in 1995. For me personally, the best part of the gathering was the connections made with other like-minded individuals. I had a deep sense of "this is my tribe" even though I did not personally know many of the participants. This gathering at the Readers Studio 2011 demonstrates that the study of the Tarot is becoming more of a mainstream pursuit. And the High Priestess, Key #2 of the Major Arcana, which represents significant spiritual awakening and a higher development of the universal psychic mind, is the specific Tarot card that best captures the intent of this assembly of like-minded individuals. Awesome and mysterious, the High Priestess sits before a veil that drapes the entrance to a temple. The temple symbolizes higher knowledge, spiritual knowledge, the sacred truths, both personally and cosmically, the "Holy Grail" that we all seek. The temple that the High Priestess guards holds both sacred, universal secrets as well as the guidance required to unravel our own personal issues. She is the guardian of the occult, of hidden knowledge, and the scroll that she holds represents arcane teachings -- teachings that those on a spiritual path must learn. She emphasizes the essential role of the unconscious mind as a channel for those sacred teachings that direct the soul’s evolution and growth. As the gatekeeper of these spiritual mysteries, the High Priestess encompasses the larger intent of the Tarot deck -- to guide us on both our earthly and spiritual paths. She reminds us that the pictorial journey portrayed in the Tarot is meant to aid us in invoking the wisdom and power locked within ourselves. The High Priestess is essentially the “spokeswoman” for the entire Tarot deck because the Tarot’s “system” is a tool that enables us to access the vast storehouse of knowledge within our unconscious mind. Thus, as the spokeswoman, she can also be understood as the guiding symbol of events like the Readers Studio, underscoring the fact that the study and use of the Tarot as a tool for inner guidance is becoming more and more a mainstream phenomenon. The metaphoric High Priestess and her "followers" unofficially began on Thursday night with a pre-conference class which dealt with the "Forty Faces of Love" as they appear in the Tarot. The official opening ceremonies on Friday morning included the "foundation" Tarot reading which was meant to offer a framework for the weekend to come. This was followed by the first "master" class in the afternoon. Corinne Kenner was the presenter and her topic was the use of Tarot in combination with astrology. Corrine Kenner is a well-known and well-respected Tarot author -- she has written 12 books on the subject, including Tarot for Writers, Tarot Journaling, and Simple Fortunetelling with Tarot Cards. She's the creator of the Epicurean Tarot deck as well as the recently published Wizards Tarot. Some of her books, including Strange But True and Crystals for Beginners, have been translated for a worldwide audience (Portuguese, Italian, Romanian, and Russian). Her presentation was informative and very well-paced. Even for those of us who are "astrologically impaired," the class was informative and practical. Both Friday and Saturday evenings consisted of smaller "break-out" classes that included such topics as Finding Fortune, Tarot Clusters, Social Media for Tarot Readers, Metaphysical Tarot, How to Read the Minor Arcana, How to Play Games with the Tarot and Majors Only Reading. The breadth and depth of the various workshops offered at the Readers Studio once again seems to underscore that the Tarot is becoming a mainstream phenomenon and that it is also being applied and integrated into many areas of life: science, business, psychology, alchemy, spirituality and more. The course selection was really any Tarot enthusiast’s heaven (and agony to have to choose between the five or six classes offered at the same time). These evening workshop presenters included internationally know Tarot teachers and authors, such as Rachel Pollack, author of 78 Degrees of Wisdom, The Haindl Tarot and creator of the Shining Tribe Tarot and James Wanless, creator of the unique and popular Voyager Deck and author of numerous books on the Tarot. Saturday began with a breakfast roundtable with famed Tarot author Mary Greer (Tarot for Yourself, 21 Ways to Read a Tarot Card and The Tarot Court) as well as a Tarot meditation class offered by Carolyn Cushing. The next "master" class was led by Barbara Moore. Moore has written books and booklets for several decks, including Tarot for Beginners, A Guide to Mystic Faerie Tarot, The Gilded Tarot Companion, The Enchanted Oracle, The Mystic Dreamer Tarot, The Vampires of the Eternal Night Tarot, The Witchy Tarot, The Dream Enchantress Tarot, Tarot of the Sweet Twilight, Shadowscapes Tarot, Pagan Cats Tarot, The Pagan Magical Kit, and The Book of Shadows Tarot, volumes 1 and 2. Her topic was "Creating Your Own Tarot Spreads" and it was a well-organized (with a power point production) packed with lots of great tips on how to make and use spreads according to you or your client's needs. Barbara is a dynamic speaker and was able to get participants involved in the creation process by offering cupcakes to those who were willing to share their spreads and ideas. It was great fun. After lunch, the final master class was held with Caitlin Matthews, creator of the Celtic Wisdom Tarot (perhaps one of the most beautiful Tarot decks I’ve ever encountered). 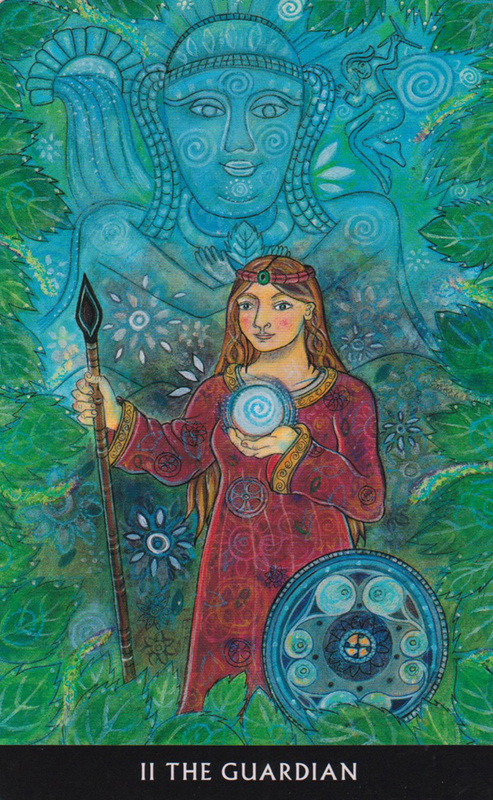 (See The Guardian Tarot card, which corresponds to the High Priestess, below from the Celtic Wisdom Tarot). Matthews speaks with a lovely accent and sings beautifully -- this was the first workshop I have ever attended that began with a song, sung by Ms. Matthews in her angelic voice. Caitlín Matthews is a writer and teacher and is considered to be an authority on Celtic Wisdom and the ancestral traditions of Britain and Europe. She is the author of over 60 books, including Singing the Soul Back Home, Walkers Between Worlds and, with John Matthews, the StoryWorld series of storytelling cards. Caitlín's other books include Mabon and the Guardians of Celtic Britain, The Psychic Shield, and Sophia, Goddess of Wisdom. Her books have been translated into more than forty languages from Brazil to Japan. She is the originator of three tarot decks: The Arthurian Tarot, The Da Vinci Enigma Tarot and The Celtic Wisdom Tarot, as well as many divination systems including The Celtic Book of the Dead, Celtic Wisdom Sticks: An Ogam Oracle and the forthcoming Celtic Ancestor Oracle. She has a shamanic practice in Oxford, England that provides soul, vocational and spiritual guidance. Her topic at the Readers Studio was about the variety of ways we can use a "significator" in a Tarot spread. The significator is the card in the Tarot deck that represents the person receiving the reading and is meant to help ground the reading by embodying this individual (called the "querent"). Saturday evening offered a bountiful banquet in which participants who chose to, dressed up as his or her favorite Tarot card. Seeing the Tarot images brought to life in such creative and imaginative ways was marvelous. My personal favorite costume was a man who dressed up as The Hermit. He had on a monk's frock, a long beard and carried a lantern around with him the entire evening. It was hard to tear ourselves away from the festivities of the banquet to attend the evening break-out sessions. On Sunday morning, we did the follow-up to the foundation spread from Friday morning with the goal being to see if and how our reading style had changed and evolved through the teachings offered over the weekend. Personally, I greatly enjoyed attending the classes and being on the cutting edge, so to speak, of Tarot “technology,” new decks and new ideas, but the high point of the weekend for me was sharing in the camaraderie and community fostered by this meeting--just being among other Tarot enthusiasts was both exhilarating and nurturing. I was also fortunate to be an instructor at the Readers Studio 2011 in one of the break-out sessions, and I was delighted by the enthusiasm, knowledge and understanding about the Tarot of those individuals who attended my class. The level of sophistication of the participants is a further indicator of the Tarot’s increasingly widespread popularity. Certainly the Tarot is not the only vehicle that promotes the development of both the conscious and unconscious (other tools include the I Ching, Rune Stones, crystals and the like), but the Tarot is a tool that is accessible, inexpensive, easy to use and a virtual gateway to a vast bounty of knowledge. In addition, there are many, many books available on the subject that can enable you to teach yourself about the gifts of the Tarot and its ability to help you to tap into the potent resources within. Perhaps all the changes that have occurred in the last decade or so has fostered this renewed interest in mysticism, spiritualism and various intuitive tools. The fact that the Readers Studio took place at all suggests to me that our culture’s interest in exploring other dimensions of reality is growing and that esoteric tools like the Tarot are becoming accepted into the mainstream. There are other indications in our society as well of a renewed interest in all things mystical, intuitive and psychic. For example, a recent article in the Washingtonian Magazine noted a significant increase in interest in such matters, with “52 percent of us believing in spiritualism, the idea that our spirits live on in a different form after we die. That’s compared to 12 percent in 1976.” And many spiritual leaders believe that a spiritual revolution and transformation are at hand. Carolyn Myss, author of Anatomy of Illness , Sacred Contracts, Why People Don't Heal and How They Can, and most recently, Defy Gravity and an internationally-known speaker, states that our spiritual journey is about “breaking our allegiance to human reason and entering into divine order.” Marianne Williamson, author of A Return to Love and an internationally-known speaker, says, “We are now experiencing an alteration of collective consciousness . . . a spiritual renaissance is sweeping the world . . . it is a revolution in the way we think.” It is a shift in our understanding of who we are and what our purpose is on earth and includes an expanded view of ourselves as multi-dimensional beings. In that shift, tools like the Tarot offer both spiritual insight and practical guidance for carving out this transformation. It’s a great time to be alive, to witness the expansion of higher potentials for humanity. It’s awesome to be within a societal milieu that is bubbling with ways to explore and honor the development of our intuition and our inner spirituality. Now, if you want to explore the Tarot as a tool for invoking your intuition and your wise inner teacher, you can invite the High Priestess to come to your aid. Simply take the card, place it before you, light a candle, take some deep breaths and gaze at the image. You can use her image as a way to stimulate or trigger your own inner intuition and wisdom. You can focus on the High Priestess in a meditation or when you seek guidance about a decision or problem. Besides meditation on the card’s image, you can also place the card under your pillow at night, carry it around with you, tape it to your bathroom mirror, or display it in any strategic place in which the imagery will “impregnate” your conscious and unconscious mind. As you allow the imagery to connect with your unconscious, you will release a corresponding resource from within. As your consciousness becomes saturated with the potent image of the High Priestess, she may help you to "bypass" your ego and your logical, conscious mind. A quiet meditation on the High Priestess card can signal to the unconscious that you want to make contact with it and its vast resource of wisdom. Geraldine Amaral is the co-author of Tarot Celebrations: Honoring the Inner Voice and creator of “Tarot 1-2-3,” an instructional video. She fell in love with the Tarot about 30 years ago when she had her first reading and has been using, studying and writing about the Tarot ever since. She utilizes Jungian/archetypal psychology and Divine Metaphysics in her work and is a respected/gifted intuitive counselor and nationally-known teacher. She focuses her work on how to apply the Tarot's esoteric principles in pragmatic ways as well as for insights and personal transformation. Her classes provide a unique blend of spirituality, psychology, philosophy, humor, literature and personal empowerment methods. She can be reached at 703-671-7421 or geraldine@thespiritualtarot.com and website www.thespiritualtarot.com.